Volatility has returned. While stock market returns were truly remarkable in 2017, the good times only continued into late January of this year. Since then, the market declined more than 8% from its peak into the end of the quarter. However, the downturn isn’t the real story. The whipsaw action of the stock market is what has drawn the most attention. With talk of rising interest rates and a possible trade war, the stock market has gyrated wildly, often rising or falling more than 700 points in a day. Despite the volatility, the stock market was relatively flat in the first quarter. The S&P 500 index posted a loss of less than 1%. Indeed, most market segments were plus or minus a little for the quarter. Coming on the heels of 2017, when practically all stock market segments rose well into the double digits, a quarter of treading water isn’t so bad. In fact, given the gains of the past several years, a reading of 24,000 on the Dow Jones Industrial Average isn’t so bad, even if it is down from 26,600 earlier in the year. Still, the recent volatility does have many investors wondering where we go from here. I’m fond of pointing out that market forecasts are generally not worth the paper they are written on, and our own forecasts are no different. But, in our view, the economy is too strong for a really nasty, drawn out market decline. There certainly is room to drop further from here, particularly if trade negotiations with China do not materialize and deep tariffs are put into place globally. However, low unemployment, strong corporate profits, and robust housing prices in much of the country have made for a high level of confidence among corporate managers and consumers. Reductions to both the personal and corporate tax rates are likely to magnify those effects. We believe it will take more than trade posturing between the world’s largest nations to derail the economy, even this late in an economic recovery. The stock market and the economy don’t always move in the same direction, so a downturn in stocks is still possible. However, without a fall in GDP, stock market declines are usually short-lived dips rather than protracted bear markets. While today’s volatility seems extreme, it is not that unusual. Rather, the sanguine markets of the past year or so are actually the more unusual scenario. The average decline in any given calendar year has been just under 10%. This can happen even in years when stocks end the year on a positive note. Thus, starting the first quarter with a flat market really provides no indication of what the rest of the year could look like. Meanwhile, returns from bonds and alternative investments were similarly yawn-inspiring. Bonds lost 1.5% as the Fed continued to raise interest rates. At one point, the ten-year Treasury yield climbed almost as high as 3.0%, but fell back down around 2.75% by quarter end. The strong economy has some investors nervous that inflation could be a concern in the not-too-distant future. There are signs inflation is already picking up, though it is still low by historic standards. Rising inflation is bad for bonds, as their fixed yield become less attractive as prices in the broader economy rise. Alternative investments were slightly positive as per the HFRI index. However, the funds we use were down a little in aggregate. Their decline was nowhere near as large as the stock market, so they have fulfilled their role of mitigating risk. One quarter is not enough time to draw conclusions about alternatives, and our funds are a pretty diverse lot. The private real estate funds we use were up, as was our reinsurance fund. However, other funds declined somewhat. Some of these funds have seasonality in their returns, so we will be better able to assess their performance later in the year. Overall, the first quarter was much ado about nothing. 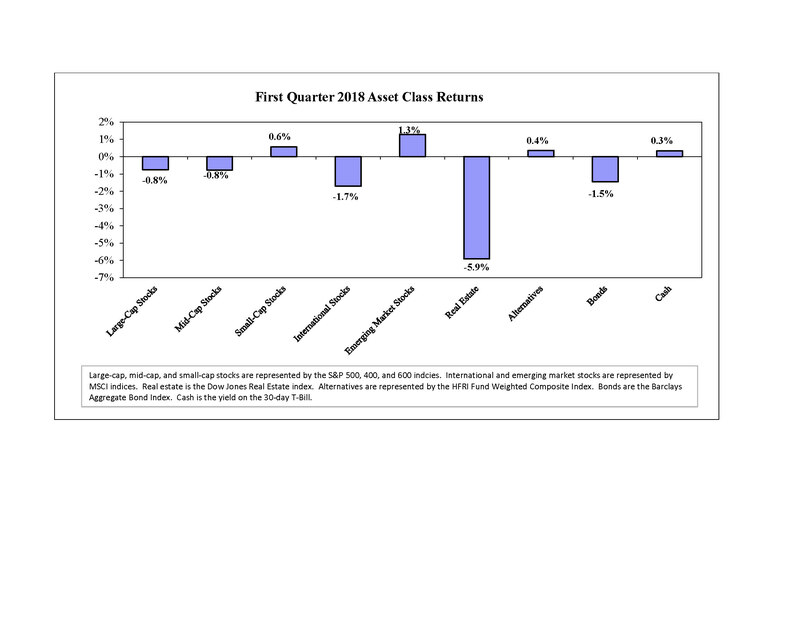 Returns across pretty much all markets were generally flat. We still have most of the year ahead of us, so we’ll root for calmer markets and a more positive trend.